State-owned telecom operator Bharat Sanchar Nigam Ltd (BSNL) launched Fixed Wireless Phone over GSM platform with attractive prepaid tariff plans in Karnataka Telecom circle. Fully loaded with all popular features, BSNL GSM Fixed Wireless Phone (FWP) will cost Rs.2100 and comes with free usage of 350 minters per month for the period of one year (total 4200 minute in a year). 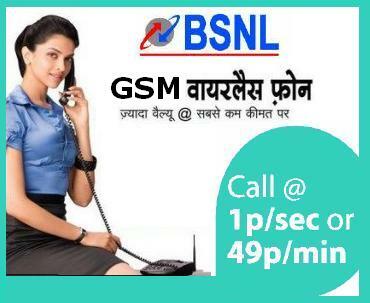 The free minutes can be used to make calls to any BSNL phone (Local/STD) any where in India. BSNL introduces two affordable tariff plan at Rs.62 and Rs.68. Plan-62 will comes with talk time of Rs.15 and provide pay per second tariff while Plan-68 comes with talk time of Rs.25 and provide per minute plan where in subscriber can make local and STD calls to any network at 49 paisa per minute. Beyond 365 Days customer can use STV 45 or STV 49 to continue the tariff plan as their requirement. Customer has to top up their account with Rs.200 in every six months to retain life time validity. All top-up and full talk time recharge are allowed. 1. A large Display Screen. 2. Ability to send and receive SMS. 5. There are accessories like Clock / Calculator etc. 6. Supports 3 party conferencing. 9. Support 10 Polyphonic ringing tones. 10. Calls divert possible just like Mobile phones. you din’t mention the price of the handset………..
in BSNL no one wont reply to customer’s message…..
Is this available in Bankura district of West Bengal?? ?